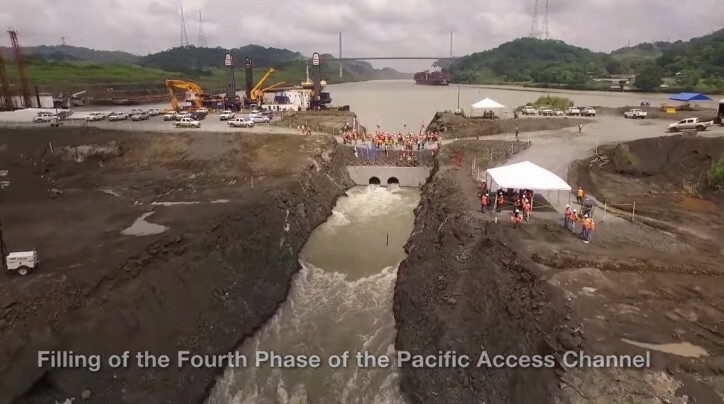 Along the lines of the 4th phase of the Pacific Access Channel’s Expansion Program, the process of filling the new channel has been officially initiated. The new channel is going to be responsible for connecting Culebra Cut to the Pacific side’s new locks. It has a 6.10-kilometer length and a 218-meter width. In order to fill it, 19 million cubic meters of water are to be taken from Gatun Lake. According to estimates, the new channel’s water level is going to go up by 0.5-1.0 meters daily during the 20-day filling sequence. The project dealt with the procedures of removing 26 million cubic meters of material and the building of a dam with a length of 2.4 kilometers.